Home / Flying Squirrels / FS3 Mission Summary – Gone with the Wind. This is a summary of the FS3 flight. 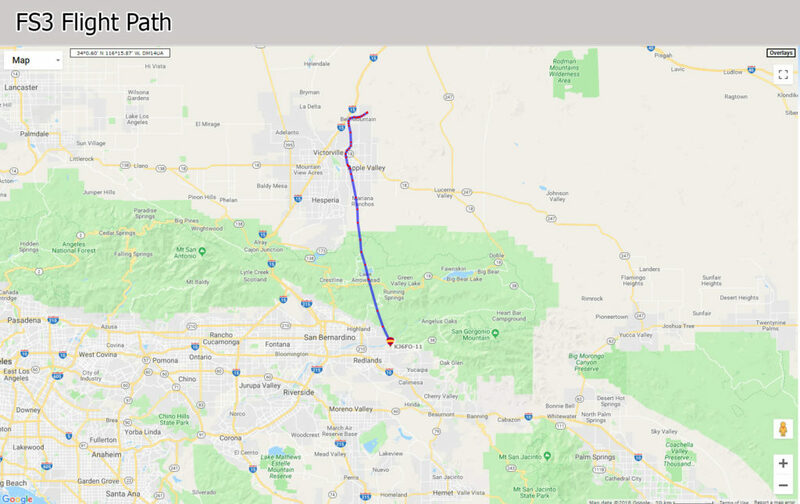 More detailed data/analysis will follow, but for those following along, I wanted to let you know how the flight progressed. Curious Squirrels need to know! As mentioned in the more recent Mission updates, Southern California received a good amount of rainfall in the two days before our launch date. California needs this rain badly, so YEA!!!!!! However, the rain left our normal launch area soaking wet and muddy. The dry lake was no longer dry, and it was impassable. When we arrived in the area, there was quite a bit of fog and poor visibility. The predicted flight path also indicated that FS3 was going to land perilously close to the Salton Sea. (Squirrels don’t do well in water landings). We decided we would change our launch location towards an area North West of the original planned launch area which would shift the flight path away from the water. We moved to an area known as Stoddard Wells or the Stoddard Valley, located along Interstate 15. We found a dry launch location with few power poles nearby. The fog lifted up to a ceiling about a few hundred feet above us. The local hills were still shrouded in the fog. Wind conditions were very calm. The launch went very well. We had 30 grams of lift on the payload and our Squirrel was eager to fly. We let go and then balloon ascended. Within a few minutes it disappeared into the clouds. The telemetry signal was very strong. All was going well! As we tracked the balloon, the telemetry signal remained very strong. The balloon was not moving down range too quickly, given the calm wind conditions. It was ascending at about 3.3 meters per second which is a very good rate. (7.3 Mph) Higher up FS3 picked up a wind and accelerated across the desert floor towards the west. A few times during the flight the telemetry indicated that FS3 was not getting a new position fix on the GPS. In the absence of a new fix the telemetry continues with a repeat of the last position data and fresh sensor data. “Oh no the GPS died”, I feared after three failed fixes in a row. Then the GPS recovered, glitching briefly once again and then remained solid for the rest of the flight. All was going well. The outside and inside temperatures were falling fast and getting very cold. FS3 was rising quickly at a steady rate to 9,100 meters (29,855.64 feet) and then sudden failure of the telemetry. The -3abqja in the last line, we can guess, was a temperature of -30 and then the rest we cannot say. FS3, despite a search of possible landing areas, could not be heard again. So what happened to FS3? The balloon burst and then FS3, in free fall, may have tangled up the wire antenna, not allowing it to radiate anymore. The hardware literally froze up and failed catastrophically. A further analysis of the data is ongoing as to the cause of failure. Without finding our FS3 Squirrel, we may never know for sure. But there is a clue in the last line of telemetry data that may favor #2 above. If the clue pans out, this will be the subject of a future article. I am waiting for more collected data from other reception reports that may resolve this clue. I will be organizing the data and publishing more results soon. Stay tuned. Thank you for following the FS3 flight! My thanks also go out to the Ground Squirrel team! Eric KB6BZZ, Mike KA9CQL, and our new member Dan WA6PZB. We had a lot of fun! Hope someone finds FS#3 and sends it back to you! Sorry that you lost her. It was fun trying to follow along! That is our only hope now. Squirrel fur is a remarkable insulator but I question whether it works when it’s frozen solid. Looks like altitude achieved was much higher this time! Plus the launch was immediately following snow producing weather so temperature at altitude might have even lower than normal (just a thought – I haven’t verified that). 1. Comparing FS3s temp data to published averages, our flying mammal with aviationist tendencies didn’t seem to get very cold. It’s enough of a discrepancy to question the accuracy of the temp sensor data. In my mind, it justifies doing some testing with dry ice. Bonus – you get to play with dry ice! 2. If it turns out that our furry friend got much colder than realized on this scurry, a warming solution will be needed for this apparently warm blooded package. I’m assuming a styrofoam exoskeleton. You could give Rocky a fever prior to launch (payload preheating) but that would diminishing returns as the temperature differential increased. Alternatively, if the you can seal the nose, mouth and ears well (Dear PETA & Sarah Mclachlan- he’s going to frozen solid anyway), onboard heating could be used. The thing that comes to mind that migbt meet the required weight/heat ratio is something derived from chemical hand warmers. I’ve never torn apart a chemical hand warmer begore. This might warrant a trip to Bass Pro Shop (or at least Big 5 or Harbor Frieght).